Watch Botany Without Borders, a video produced by the Botanical Society of America about the importance of plants. In plants, just as in animals, similar cells working together form a tissue. When different types of tissues work together to perform a unique function, they form an organ; organs working together form organ systems. Vascular plants have two distinct organ systems: a shoot system, and a root system. 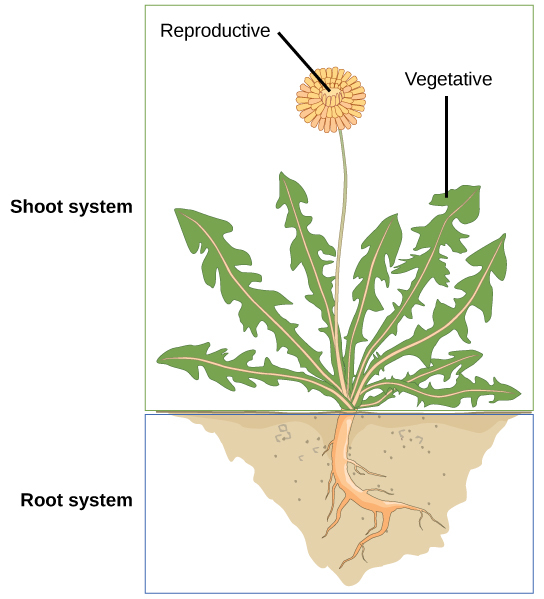 The shoot system consists of two portions: the vegetative (non-reproductive) parts of the plant, such as the leaves and the stems, and the reproductive parts of the plant, which include flowers and fruits. The shoot system generally grows above ground, where it absorbs the light needed for photosynthesis. The root system, which supports the plants and absorbs water and minerals, is usually underground. [link] shows the organ systems of a typical plant. The shoot system of a plant consists of leaves, stems, flowers, and fruits. The root system anchors the plant while absorbing water and minerals from the soil. Plants are multicellular eukaryotes with tissue systems made of various cell types that carry out specific functions. Plant tissue systems fall into one of two general types: meristematic tissue, and permanent (or non-meristematic) tissue. Cells of the meristematic tissue are found in meristems, which are plant regions of continuous cell division and growth. Meristematic tissue cells are either undifferentiated or incompletely differentiated, and they continue to divide and contribute to the growth of the plant. In contrast, permanent tissue consists of plant cells that are no longer actively dividing. Meristematic tissues consist of three types, based on their location in the plant. Apical meristems contain meristematic tissue located at the tips of stems and roots, which enable a plant to extend in length. Lateral meristems facilitate growth in thickness or girth in a maturing plant. Intercalary meristems occur only in monocots, at the bases of leaf blades and at nodes (the areas where leaves attach to a stem). This tissue enables the monocot leaf blade to increase in length from the leaf base; for example, it allows lawn grass leaves to elongate even after repeated mowing. Meristems produce cells that quickly differentiate, or specialize, and become permanent tissue. Such cells take on specific roles and lose their ability to divide further. They differentiate into three main types: dermal, vascular, and ground tissue. Dermal tissue covers and protects the plant, and vascular tissue transports water, minerals, and sugars to different parts of the plant. Ground tissue serves as a site for photosynthesis, provides a supporting matrix for the vascular tissue, and helps to store water and sugars. Secondary tissues are either simple (composed of similar cell types) or complex (composed of different cell types). Dermal tissue, for example, is a simple tissue that covers the outer surface of the plant and controls gas exchange. Vascular tissue is an example of a complex tissue, and is made of two specialized conducting tissues: xylem and phloem. 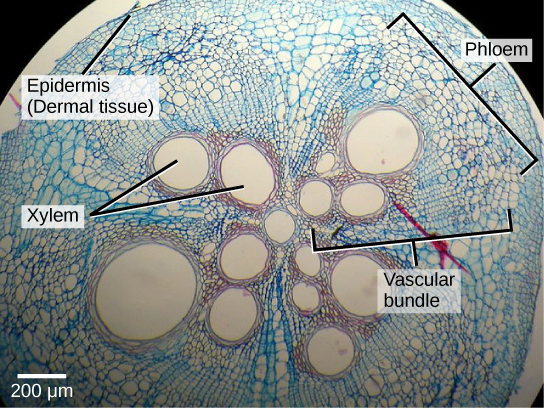 Xylem tissue transports water and nutrients from the roots to different parts of the plant, and includes three different cell types: vessel elements and tracheids (both of which conduct water), and xylem parenchyma. Phloem tissue, which transports organic compounds from the site of photosynthesis to other parts of the plant, consists of four different cell types: sieve cells (which conduct photosynthates), companion cells, phloem parenchyma, and phloem fibers. Unlike xylem conducting cells, phloem conducting cells are alive at maturity. The xylem and phloem always lie adjacent to each other ([link]). In stems, the xylem and the phloem form a structure called a vascular bundle; in roots, this is termed the vascular stele or vascular cylinder. A vascular plant consists of two organ systems: the shoot system and the root system. The shoot system includes the aboveground vegetative portions (stems and leaves) and reproductive parts (flowers and fruits). The root system supports the plant and is usually underground. A plant is composed of two main types of tissue: meristematic tissue and permanent tissue. Meristematic tissue consists of actively dividing cells found in root and shoot tips. As growth occurs, meristematic tissue differentiates into permanent tissue, which is categorized as either simple or complex. Simple tissues are made up of similar cell types; examples include dermal tissue and ground tissue. Dermal tissue provides the outer covering of the plant. Ground tissue is responsible for photosynthesis; it also supports vascular tissue and may store water and sugars. Complex tissues are made up of different cell types. Vascular tissue, for example, is made up of xylem and phloem cells. Plant regions of continuous growth are made up of ________. Which of the following is the major site of photosynthesis? What type of meristem is found only in monocots, such as lawn grasses? Explain how this type of meristematic tissue is beneficial in lawn grasses that are mowed each week. Lawn grasses and other monocots have an intercalary meristem, which is a region of meristematic tissue at the base of the leaf blade. This is beneficial to the plant because it can continue to grow even when the tip of the plant is removed by grazing or mowing. Which plant part is responsible for transporting water, minerals, and sugars to different parts of the plant? Name the two types of tissue that make up this overall tissue, and explain the role of each. Vascular tissue transports water, minerals, and sugars throughout the plant. Vascular tissue is made up of xylem tissue and phloem tissue. Xylem tissue transports water and nutrients from the roots upward. Phloem tissue carries sugars from the sites of photosynthesis to the rest of the plant. 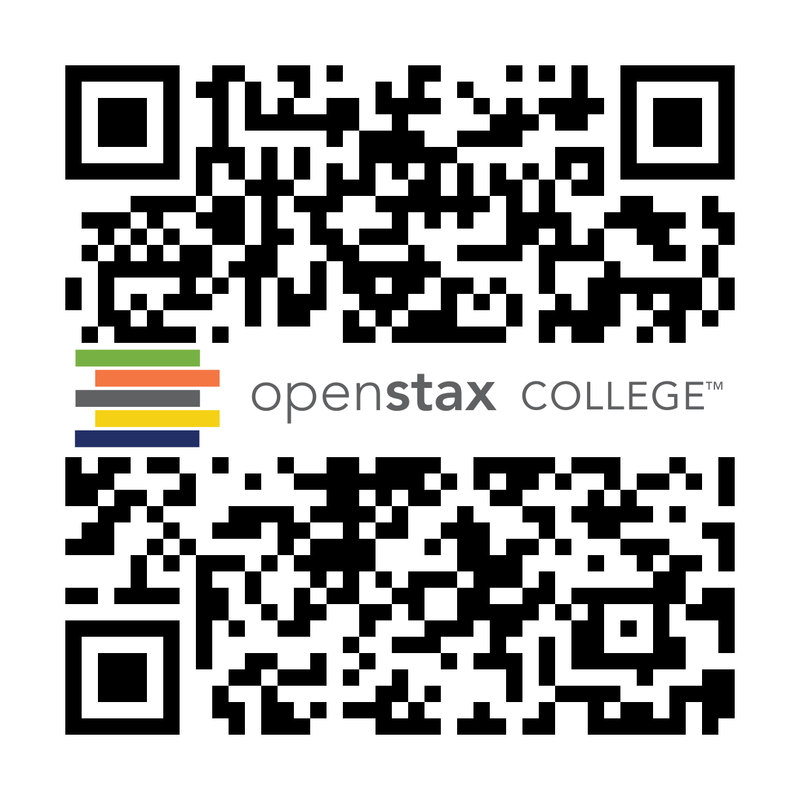 The Plant Body by OpenStaxCollege is licensed under a Creative Commons Attribution 4.0 International License, except where otherwise noted.